Brook, excited over the way he has finally bagged himself the kind of big fight he has been craving since he closely out-pointed Shawn Porter to take the IBF belt almost two years ago, has Tweeted “Any day now!” referring to the official announcement of the fight. Initially, Vargas, 27-1(10) said he would not come to the UK, suspicious as he was off being mistreated by the British officials, meaning, primarily, the judges who would score his fight with Brook. But money talks, and Hearn told Boxing News that a substantial payday has likely managed to lure Vargas across the pond to England for the very first time. So, if the announcement goes ahead without any unforeseen hiccups, Brook, 36-0(25) will once again enjoy home advantage in a fight; this one being the third out of the last four Brook bouts to have been staged in The Steel City. Brook, last seen wiping out mandatory challenger Kevin Bizier inside two easy-looking rounds in April, will be making the fourth defence of his IBF belt against Vargas. Vargas, last seen winning the WBO belt with an impressive 9th-round stoppage of Sadam Ali in March, will be making the first defence of the belt. This is a tough fight for both men, but Brook seems to have the upper hand as far as it being fought in his backyard. Vargas – probably best known to fight fans for his losing fight with Tim Bradley, when he appeared to badly hurt Bradley in the very last round last June, only for the referee, thinking he had heard the bell when in fact he’d heard the ten-second warning, to dive in and call a halt to the fight; possibly depriving Vargas of a late stoppage – will be hoping nothing controversial happens on August 27th. But this fight does have the look of a distance fight. A Brook points win looks quite likely. Let’s just hope Vargas does not go home feeling Brook benefited from a gift decision. 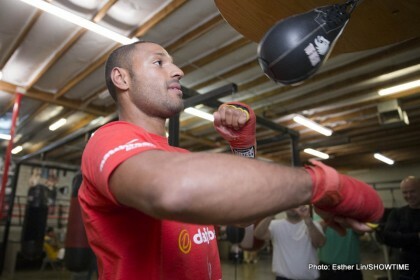 Brook needs to win this one fair and square, then even bigger fights will surely come.